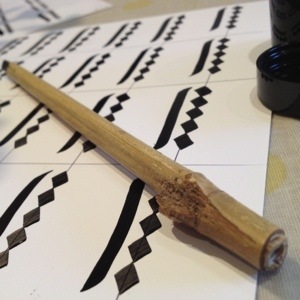 Just before the summer I got the idea in my head that I wanted to learn Arabic calligraphy. A couple of years ago I did a bit of research and found out that there’s a lot more to it than first meets the eye. It’s not just about curling letters weaving out words of prayer- there’s a very exact science to it. Each letter has to be a certain proportion in relation to the others. After searching the web I realised that there wasn’t much self teaching material around and that the only way to learn it properly was to be taught by a teacher. So this summer I looked for course I could fit into what little holiday I had. I figured I had to do it now, in my last year as a student, before work and other life related things got in the way and force it to become a withered dream that I never got the chance to fulfil. I did some research and found a few starting in the holiday but unfortunately for me the first lessons overlapped with my exams. No calligraphy for me. Then I found a few more which were going to be during term time but on Wednesday evenings. But knowing that I would be in a hospital placement out of London for most of the course I ruled them out based on travel logistics. Grudgingly I resigned myself to the fact that this probably wasn’t going to happen…. Until an event popped up on my Facebook home screen a few weeks ago. A local community centre (literally 5min away) had a class running and due to high demand, they were setting up a weekend class. Could this be more perfect? At first it looked like Tree wouldn’t be able to join me because of work, but out of the blue they emailed to say they were changing the time. This course really did seem heaven sent. So we signed up and last week we went to our first lesson. Oh was it amazing. The teachers enthusiasm was just infective! He told us about the history of Arabic calligraphy and introduced us to the concepts that make the basis of the art form. Then showed us how to make our own reed pens…from a bamboo stick! 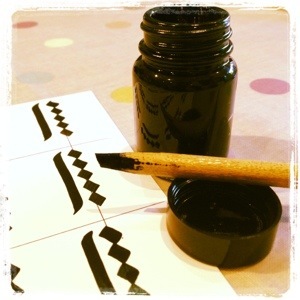 For our first lesson we learnt how to make dots and Alif, the letter on which the rest of the alphabet is proportioned. Effectively, we were doing dots and lines. Simple right? Oh no. Most definitely not. Who knew it would be so hard! Theres a science to everything: Depending on which script you’re doing, the number of dots relate to the length of your Alif. So in this script the Alifs are five dots long. Even the dots have a particular method! Our homework was set (two pages of dots and Alif) and we were given strict instructions not to get carried away and start doing the other letters because we don’t have enough knowledge yet to do them! It’s quite humbling to think that after 2 hours we had only learnt enough to do dots and straight lines- which we hadn’t even perfected! Anyway, I know this doesn’t quite fit in with my normal blog posts but I thought it would be nice to post something chronicling this path of learning. I’m actually writing this entirely phone based (including photos, so apologies if they’re not great quality) to make it extra quick to do in the hope I can do it every week after the lesson! Perhaps when I get more time I can actually write up what we’re being taught in case someone might be encouraged to give it a go! After all, I think you’d be hard pushed to find something more therapeutic than holding a gnarly bamboo stick in your hand, dipping it in and out of an ink pot and creating something beautiful.